Red removal has been very situational all the time, but kind of solid if it can go off. They seem to continue this route. 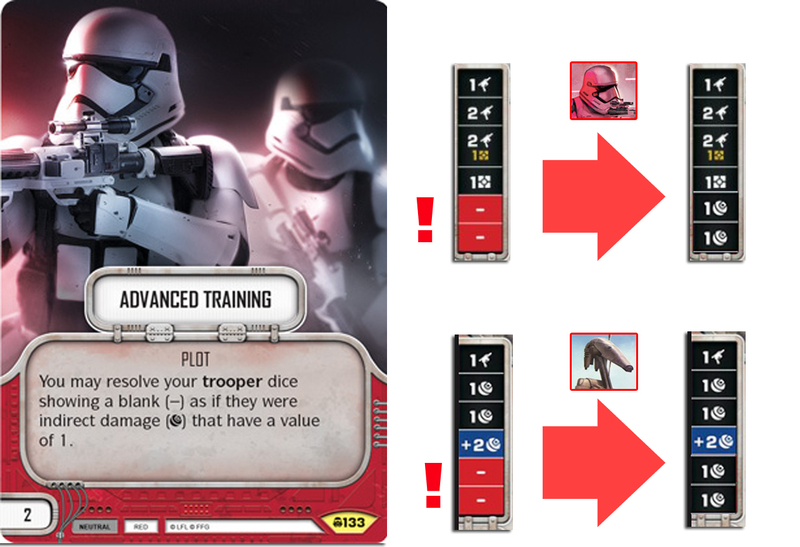 As expected, neutral red gives some options for theme based trooper decks and offers at least 4 reasonably good cards. As a 0 cost downgrade HAMPERED is looking really good. It is going to be a serious roadblock for fast aggro decks relying on upgrades to modify few base damage sides, and could be bad news for midrange decks as well. It does look like more and more characters are getting 3 damage sides, so the problem might not be too big after all. A solid removal if you play a droid focused deck with Doctor Aphra, or a great removal card if you have a droid (like Battle Droid, Commando Droid, Super Battle Droid) in your character line up. 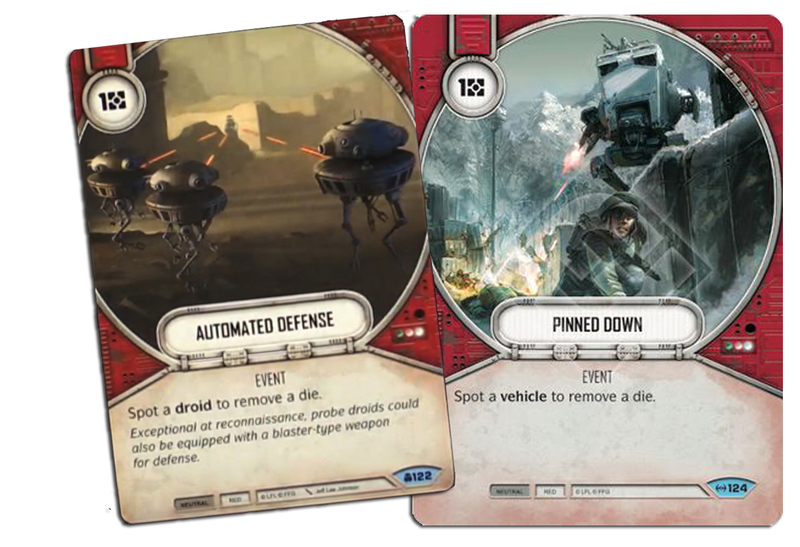 It is similar to Pinned Down, which was a must-include in nearly every vehicle based deck. Kind of like Control and Emergency Evacuation this cards targets "all dice", but is more specific and therefor more effective than the first two. Removing any number of dice can be huge, we all know how a Mind Trick can blow your turn away - but in this case, the card is too expensive to play and is rarely worth the money. Manipulation was a card that saw some play when removal was rare. Clash also did see some play. Having to turn the opponents die to a side that you want yourself could backfire a lot. So only playable in rare cases and therefor not good in my eyes. A great ramp card for fast decks. If you are in desperate need of resources, you could also include it in slower decks and mulligan hard for it. Getting a resource out of a card with an easy to achieve and not that dangerous condition is really good. Depending on the decks speed, I would prefer this over well connected or logistics. Zero cost removal with a condition that can be achieved easily by some decks. This will definitely see play in trooper decks because its nearly as good as He Doesn't Like You, and everyone played that card. A perfect card for a mill deck. Destroy their hand to one with your discard sides and then play this to kill 4 cards with just one resource. If mill will be still a thing, this will definitely see play. Actually a decent and easy to achieve condition for a removal card. Just roll out a character with an upgrade and you are ready to go. Removing ANY die was always good - so if you are in need of a hard removal card, pick this one. For me this one is huge. Having basically a second Tactical Mastery will help a lot of aggro decks. I guess they need it, because the power of supports will not decrease. For a speedy deck, the condition is usually achievable and can not be disabled by killing the red guy in your team. A deck you could put this one in is Mother/Iden Versio, if it can be something in the upcomming meta. All in may be gone for now, but Tactical Mastery, Three steps ahead and Seize the day will make red a surprisingly fast deck colour. A reprint that did not see much play in the past few months. Probably because everyone and his mother played Yoda or Snoke, so no huge squad to activate. But if rumours are correct, there could be some Gungan, Droid or Trooper deck that could make this card work. Usually you will not achieve all three conditions. Most of the time, you will only have one of the sides showing. If you really need some trick cards, try it - I wouldn't recommend this card in a competitive deck. This looks useful and could potentially be good, if you can find a proper character shell, whether it is villain or hero based. Making sure that you always get value out of your dice is pretty cool, but 1 Indirect damage per character die is just not THAT crazy. In Standard it will be limited to: First Order Storm Trooper (villain), Veteran Stormtrooper (villain), Iden Versio (villain), Phasma (villain), Bo-Katan (hero), Mandalorian Super Commando (villain), Executioner (villain), Clone Trooper (hero), Rex (hero), Cody (hero), Conscript Squad (neutral), Fenn Rau (hero), Kes Dameron (hero), Megablaster Trooper (villain), Naboo Palace Guard (hero) and Sniper Team (villain). A solid die for a trooper based deck. 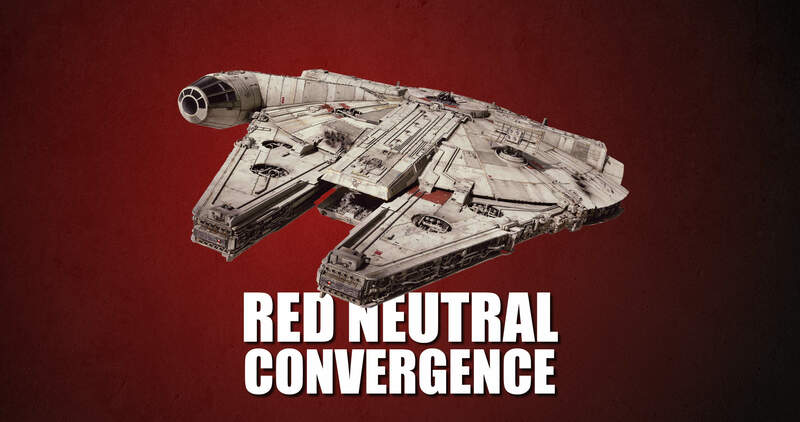 It can be included in resource weaker vehicle decks or slower Mother Talzin Aggro decks, if you combine her with red. We have seen these cards before and they did not see play. Games are just not long enough to make them work. IF you get it in your starting hand, it COULD pay off. But that is just not enough. Do not play that card. Except in draft maybe, where games are long enough to make profit out of this. Awesome card in every vehicle deck. Known and loved by everyone who brings his tank to the fight. Both, villain and hero ability are really good. I would have liked it to have a neutral effect. Having just 2 damage sides is kind of uncertain, but the discard side could pay off aswell. Especially in the villain version. Because you do not really need speed in a vehicle deck and 3cost vehicles are not the usual target for beeing destroyed, it is another contender to ARC and FANG FIGHTER. 2 cost upgrade with Redeploy is good, but those die sides are just trash. 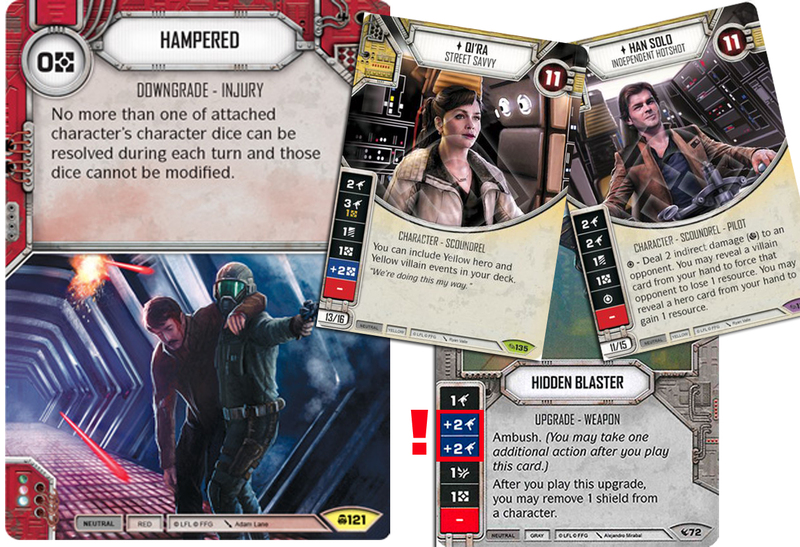 Two Disrupt sides are really bad, but the damage sides are an improvement over the Holdout Blaster that rotates out! Will probably become a staple nonetheless! So, Captain Phasma's ability suddenly makes a whole lot more sense now, and the QUICKSILVER BATON looks like an incredibly solid pick on her. I'm really feeling uncomfortable with the whole mechanic of getting to roll upgrade (and/or support) dice into the pool when playing the upgrade. It feels like we are tumbling down a rabbit's hole and games are going to end earlier and earlier. On Phasma you are basically always going to be able to resolve the Quicksilver Baton die. The stronger the trooper the better this weapon. At least it is not a free Power Action again and you have to pay for it. My rating aims at the fact, that I interpret the card text as always possible to pay 1 for a roll in. If you can gather enough resources, this would be broken as sh**. Solid pick to protect your main character. It takes an upgrade slot, but if you play it correctly the slot should free up soon enough. If not, just overwrite with something more useful.